To prepare the chicken, dice into bite-sized pieces. Toss with the cornstarch, salt and pepper. Add the oil and toss again to evenly coat. Set aside. To prepare the black bean sauce, first rinse the black beans under cold water and drain. Finely mince the garlic. Using the back of a fork, mash the beans and garlic together in a bowl. Add the rice wine, soy sauce and pepper and stir to combine. Set aside. 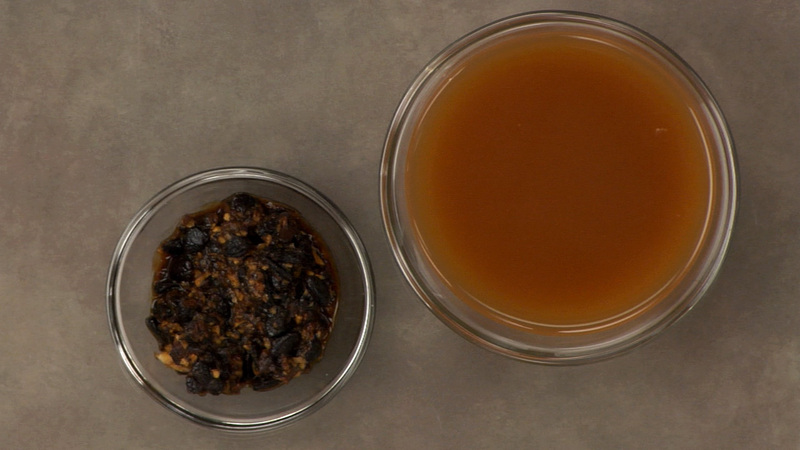 To prepare the stir-fry sauce, mix the chicken stock, oyster sauce, sugar and cornstarch together, making sure to dissolve all of the cornstarch. Set aside. *Note: Chinese long beans are also referred to as “snake beans”. If you cannot find these, you can substitute with green beans. 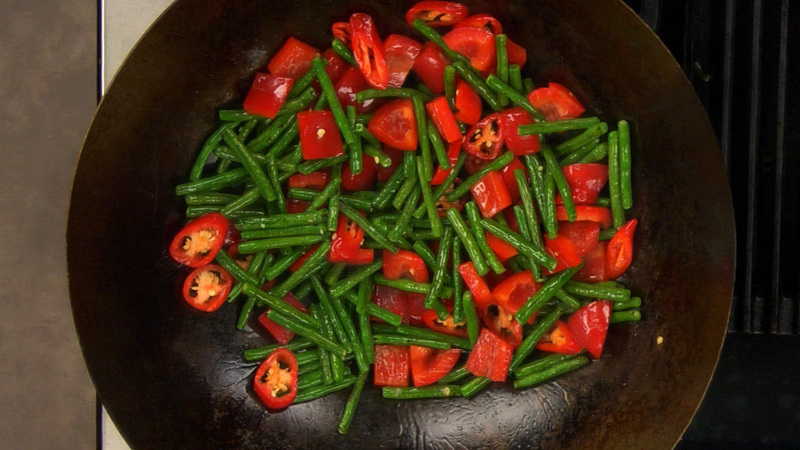 To prepare the ingredients, cut the long beans into 1- to 2" -inch pieces. Dice the red pepper into approximately 3/4 "-inch dice. Slice the Thai chili on the bias. Mince the garlic and ginger. Slice the chives. **Note: If you cannot find Chinese chives, you can substitute with green onions. Roughly chop the toasted cashews and set aside. 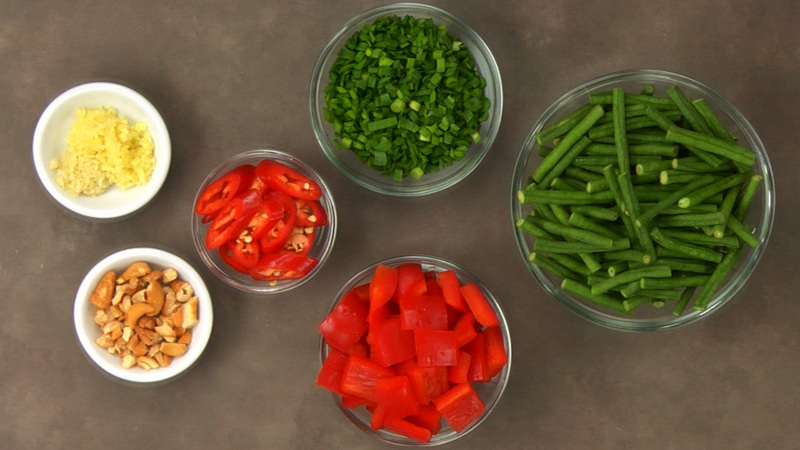 Stir-fry chicken – remove. 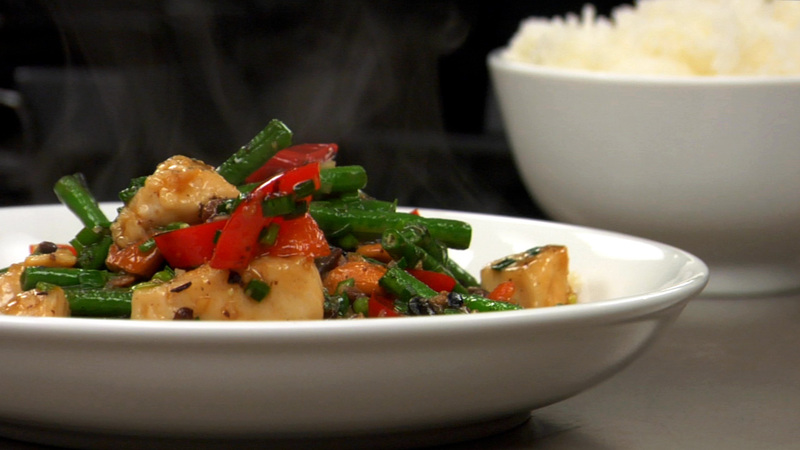 Stir-fry long beans — red peppers & sliced red chilies — add garlic & ginger — then add the black bean sauce and stir-fry for a few seconds — return chicken and juices to wok — add sauce — finish with chives and cashews. Feel free to add a touch more oil during the stir-frying process, if needed. Serve immediately. Fermented black beans (also called salted or dried black beans) are actually sold in Asian markets. They are made from soybeans that have been dried and fermented with salt and other spices. Fermented black beans have quite a strong salty (but delicious) flavor, which is why they are normally rinsed before being incorporated into a dish. When buying fermented black beans be sure to buy the ones that come in plastic bags or in the cardboard containers. If stored properly, they will last for several months. Fermented black beans are also sometimes sold in glass jars but these are often not as flavorful. Note that "black bean sauce" that is sold in a glass jar is not the same thing. Hope that helps. Cheers! Ahhhhhhh! That makes sense. Thank you for your enlightening answer. Hi. The amount of chicken in the recipe is one half or two halves of a chicken breast? Thanks in advance. The amount of chicken in the recipe is one single chicken breast, which is half of a double chicken breast. So for one bird, it would be half of the breast meat. Hope that helps. Cheers!